Anna Brewster was the daughter of the marine and landscape painter William Trost Richards, whose work is also found in the Museum's collection. Her early work was influenced by her father's detailed Pre-Raphaelite style, but gradually her brushwork became looser and more expressive. She was somewhat of a child prodigy and by the age fourteen was exhibiting at the National Academy in New York. She later studied at the Cowles Art School in Boston and then in New York with John La Farge and William Merritt Chase. Like many American artists of the time she moved to Paris, studying at the Academy Julian. After finishing her training in Paris she lived in England for nine years. On returning to America she met and then married William Tenney Brewster, professor at Barnard College. After their marriage the couple settled in Scarsdale, New York, where Anna founded the Scarsdale Art Association. Although based in New York the couple traveled throughout Europe and North Africa. While traveling Anna would sketch in oil and watercolor, and then convert into large finished canvases. 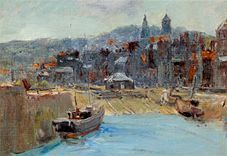 This month's Artwork of the Month, painted during one of Brewster's visits to Guernsey, illustrates her skill at depicting a scene with quick confident brushstrokes as well as her use of unifying tones bring the whole composition together.